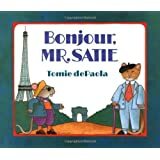 When the two world travelers visit their family, they bring Paris to America through French cuisine, a smattering of French words, and enchanting stories of the artists, authors, and other characters they befriend in Paris. The story manages to be kid-friendly and subtly sophisticated through references to Gertrude Stein, Pablo Picasso, and Henri Matisse. This is an early and quite casual representation of homosexuality that is both campy and cozy. It remains well worth the read nearly THIRTY years after it was originally published and is widely available used.